The Town of Banff manages parking to best balance the needs of residents and visitors alike. The Alberta Traffic Safety Act and The Banff Traffic Bylaw (16-7) regulate parking on all streets, alleys and public parking lots in Banff. 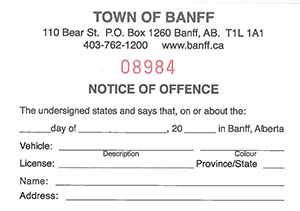 If you wish to dispute a Town of Banff parking ticket, please ensure the notice of offence was issued by the Town of Banff. Town of Banff Bylaw Services will not revoke tickets based on compassionate or personal reasons. These matters have to be heard under oath in Alberta Traffic Court. I only parked in the location for a short time. Other cars were parked there. I did not know that I could not park there. I did not see the sign/fire hydrant. I cannot afford to pay the fine. I have never had a ticket before. I am not from Banff. Initiation of the Officer Ticket Review process must be received within 14 days from the date the ticket was issued. Please note tickets that have been issued for parking on private property are not disputable.